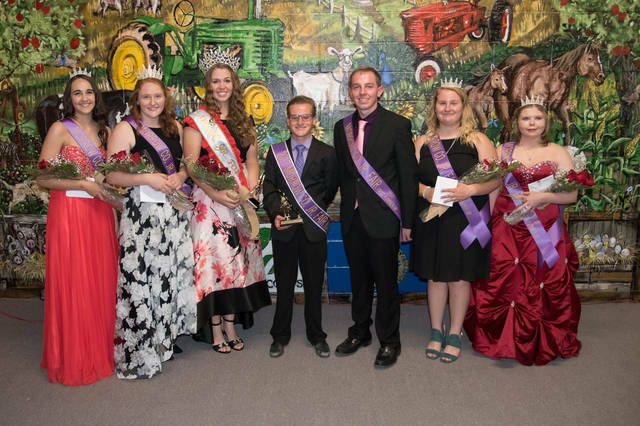 Morrow County Fair Royalty crowned Tuesday evening during the fair. They are, from left, Kayla Barker, second runner-up; Marissa Hall, first runner-up; Becca Dunckworth, queen; Manny Heilman, king; Jacob Serio, first runner-up; Alyssa Thompson, third runner-up; Andrea Oldham, fourth runner-up. The fair concludes Labor Day.